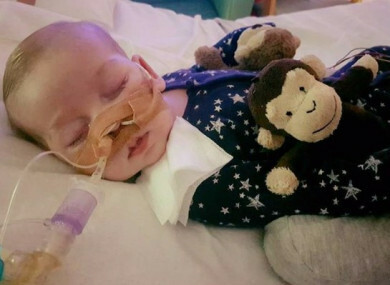 THE CASE OF Charlie Gard raises questions about what kind of medical information should be released to the public in life or death situations involving children, according to a prominent UK doctor. Professor Dominic Wilkinson specialises in newborn intensive care and medical ethics at Oxford University and argues that there is a case for making such children anonymous. Writing in the British Medical Journal today, Wilkinson says that anonymising such cases might be better for the child but could make fundraising more difficult for parents. The court of public opinion “is surely the worst possible place for ethically complex decisions”, Wilkinson writes in the article. The 11-month-old was born with a mitochondrial disease that saw him hospitalised at eight weeks and his condition rapidly deteriorate thereafter. A fundraising campaign saw €1.5 million raised online as his parents sought experimental treatment in the US. British doctors argued that the treatment would not save Charlie and could cause him pain. A legal battle followed that attracted worldwide attention. The acute focus on the case led to threats being made against doctors – as well as Charlie’s parents – and fuelled debates between pro-life and right-to-die advocates. Under this intense media scrutiny, Wilkinson argues that unrealistic or unfounded claims may also have provided false hope and contributed to the protracted legal battle. In the article, he explores a number of ways greater balance may be achieved in the future. Limit parents’ options, making it harder to fundraise for treatment and potentially harder to identify supportive expert opinion. It also conflicts with freedom of the press and raises concerns about a lack of transparency in decision-making. Another possible option explored in the BMJ article is allowing medical professionals publish the medical evidence on which they are basing their decisions. In the Charlie Gard case, this would have included the evidence which led to doctors at Great Ormond Street Hospital concluding that experimental treatment was not in his best interest. “That would enormously increase transparency, and help ensure that any wider discussion is based on relevant and verifiable facts. It would, however, breach the child’s confidentiality,” Wilkinson writes. Email “Should Charlie Gard's name have been made public?”. Feedback on “Should Charlie Gard's name have been made public?”.